Florida Beach Bar hosts a contest every year where visitors can vote for their favorite beach bar. Explore past winners and vote for your favorite! Since 2011, Florida Beach Bar asks its website visitors to vote for their favorite Florida beach bar. At the end of the competition, votes are totaled and combined with Florida Beach Bar’s proprietary Pink Flamingo Rating (proximity to the beach, amount of live music, availability of food and beverages, etc...) to determine the annual Top Ten Florida Beach Bars. 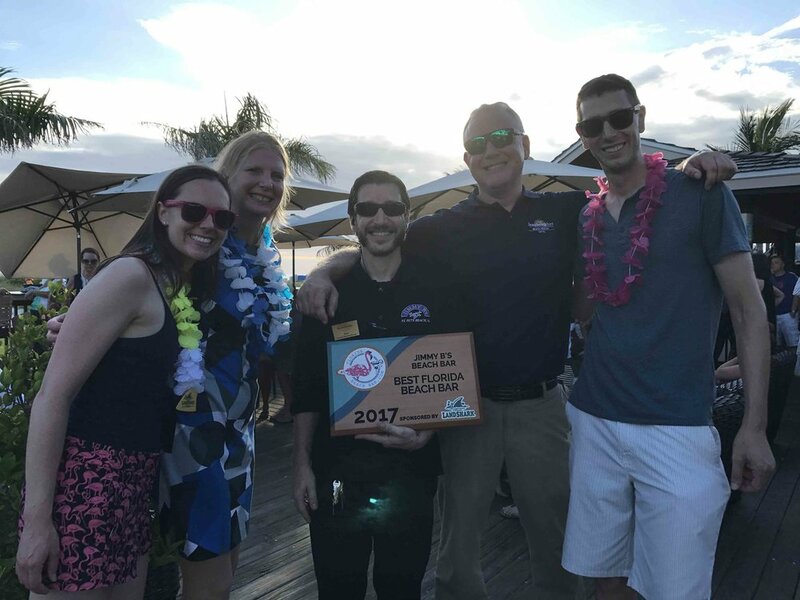 It's a fun contest that allows guests to show their Florida beach bar pride and recognize those beach bars that go above and beyond to deliver an exceptional Florida beach bar experience! Many beach bar enthusiasts cast online votes for over 200 different bars in the 2018 Best Florida Beach Bar competition. It was an exciting 4 weeks throughout the voting period and a lot of guests turned out to show their support for their favorite of 2018! Participating beach bars used local promotions, their websites, and social media to solicit votes. Thank you to all who voted and helped make this the largest turnout since competition began 8 years ago. Special thanks to the Florida beach bar owners, managers, and staff who work hard every day to bring you this important part of the Florida lifestyle! And a huge thank you to LandShark Lager who sponsored the 2018 contest! The competition for the Top Florida Beach Bar started in 2011 and since then, 18 different beach bars have made the Top 10 list. Winners from these past competitions make up the All-Time Top Florida Beach Bar list. Winners are scored on the number of times they made the Top 10 list and the ranking they attained. Only three Florida beach bars have made the list every year since the competition began: Jimmy B's Beach Bar on St. Pete Beach, The Golden Lion Cafe on Flagler Beach, and Racing's North Turn on Ponce Inlet.